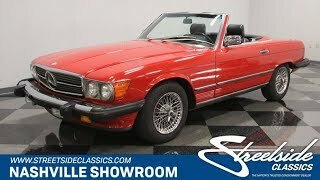 Hi, I am interested in your 1989 Mercedes-Benz 560SL (stock #1340-NSH) listed on Autotrader for $29,995. I'd like to get more information about this vehicle and confirm its availability. Mercedes-Benz has always built sophisticated luxury and performance automobiles with a reputation for performance, strength, and safety. If you have ever driven one, you know how solid they feel. If you havent, then here is your chance to come down and see what a German Sports/Luxury car is really like. Mercedes SL series cars are personal luxury cars. They were designed with clean lines and timeless elegance. Showing up in this Signal Red car gets peoples attention and makes quite a statement. Up front is that unmistakable Mercedes-Benz star that everyone knows stands for quality. It is flanked by quad headlights to light the way at night, and also has factory fog lights under the bumper, because being able to see in fog and rain is a safety consideration. Black bumper end caps front and rear blend perfectly with the side moldings, creating a pleasing visual line, but also offering superior protection from parking lot mishaps. Scalloped lower door panels make it look low and sleek. The Black convertible top compliments the red perfectly and looks great when it is folded up, but removable hardtops were standard on these cars, so go ahead and drop it on for the winter or just put it on for looks if you like. Open the door and settle into the Black leather seats. Notice that there is an airbag equipped steering wheel which was standard issue safety equipment on Mercedes several years before it was required by U.S. law. With just over 40,000 miles on this car which was obviously well cared for, the interior is super neat and clean with minimal wear. As you would expect, luxury and convenience items include power windows, locks, and air conditioning. Gauges are easily visible under a dash that helps shroud them from the glare of the sun when the top is down. The large thermometer between the vents looks rather unique, but is another safety item indicating when there are freezing temperatures outside. The factory stereo sits just over the ventilation controls and the burled wood dash treatments add warmth and a touch of old-world feel. The removable hard top is a first-class affair. When you opt to install that, it is like driving a coupe, not a convertible with a removable top. Powering this personal luxury car is the largest engine offered by Mercedes that year. But wheel spinning power isnt what this engine is about. It is about quiet, confident, power that takes you down the road with a reserved dignity. But it is also ready to step up and play if you want it to, and remember, this car is built to run the autobahns, so dont underestimate what it is quietly capable of. The four-speed automatic is smooth and efficient in the way it enables the car to run at leisurely low RPMs in top gear while traveling down the highway, but step on the gas and it will kick down and take off. The fully independent suspension has a smooth ride but will hug the corners with confidence, so when the road turns twisty, go ahead and have some fun. 4-wheel disc brakes provide a great stopping power and the car rides on chrome Dayton wire wheels with 205/65R15 tires mounted all around. Come down and see how it feels to drive a personal luxury car from Germany. You may decide its what you want to drive every day.